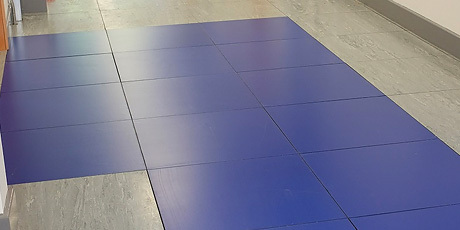 Dycem’s access tiles are particularly important in data centres. Studies show that 75% of hardware failures are caused by dirt. One hour of downtime can cost an average of £300,000 (Source IBM Today). In comparison to these figures, the cost of preventative maintenance is minuscule. The access tiles help reduce data loss, hardware failure, dust explosions and zinc whiskers by preventing dust and dirt entering your system. An inlaid access tile option where tiles containing pre applied Dycem replace existing tiles in your facility. This is an ideal solution if there is a need for a seamless flooring solution and access to cabling is required regularly. A retro fit access tile option where Dycem can be easily and quickly installed on top of your existing tiles and comes complete with an outer edge system to allow unnoticeable transition on and off the area. Click here for a complete list of benefits seen from choosing Dycem.